However, Jesus’ action in the Court of the Gentiles was more than simply an angry outburst against corruption. How do we know that? 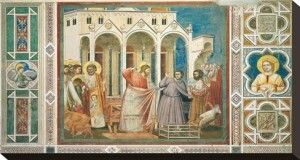 As He cleanses the area, Jesus quotes a phrase from the prophet, Jeremiah: “Will you steal, murder, commit adultery, swear falsely, burn incenses to Baal, and…then come and stand before Me in this house, which is called by My Name, and say, ‘We are delivered!’—only to go on doing all these abominations? Has this house… become a den of robbers in your eyes?” (Jer 7:9-11) Here, the judgment against God’s people is not simply doing business where they shouldn’t have; rather, it was their great hypocrisy and presumption in believing that simply by keeping Temple rituals, God would deliver them from the threat of their enemies, even though they lived in great covenant infidelity. In Jeremiah’s day, as in Jesus’ day, God’s charge against His people was their empty religion—maintaining their liturgies with hearts far from Him. The fact that the Court of the Gentiles, which was supposed to be a place of prayer and evangelization, had become a “marketplace” was emblematic of Israel’s terrible spiritual desolation. In His cleansing of the Temple, Jesus prophetically demonstrates that the Temple was no longer a place of true encounter with God, for Jews or Gentiles. It was destined to be eclipsed and replaced. That is why, when the Jews questioned Jesus’ authority for His action, He enigmatically predicts a destruction—but not of the Temple building. No, He referred to His own Body as “this Temple.” He spoke of His death and resurrection as the “sign” of His authority to bring an end to animal sacrifice (foreshadowed when He drove out the animals) and to open encounter with God to all the nations (restoring the true meaning of the Court of the Gentiles). Unlike a “zealot,” who unleashes violence on others, Jesus’ “zeal” for His Father’s house would consume Him, leading to His own death on the Cross.